The international green networking phenomenon, Green Drinks, re-opens its Tel Aviv chapter. After a great start and a long “holiday” Green Drinks Tel Aviv has kick-started again. This time organizers hope to make it a regular monthly event. 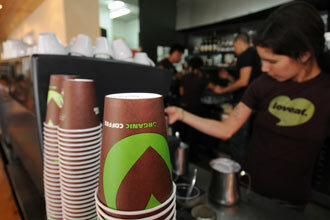 Rather than at a bar, this time Green Drinks will be at LovEat Cafe in south Tel Aviv. It’s optimal for those looking for a chance to network in the environmental field in activism and in industry (looking for jobs and causes); and for those looking to meet similarly green-minded friends. You might just want to stop by and enjoy a delicious cup of organic coffee. Green Drinks TLV will meet every monday of the month; this year January 4, 2010. For now the venue will be LoveEat until further notice. Check the Facebook page for any updates. When: 7:30 pm at LovEat on the corner of Barzilai and Mikve Yisrael, Tel Aviv. No need to RSVP, just show up and bring your friends! For more information email Karin ([email protected]) or Rachel ([email protected]). To find out more about Green Drinks international (now active in 641 cities worldwide), visit www.greendrinks.org. It’s an international happening and you can be a part of it!